Some companies that make 3D printersstick to desktop-sized units. WASP is not one of them. They do it all, from filament-fed units to giant machines that print whole buildings. A non-profit partnership is raising money to 3D-print durable and affordable concrete homes in El Salvador, in an effort to offset the global housing crisis. Each single-storey, 650 square-foot home costs US$4,000 to build using a concrete-extruding printing apparatus, which is programmed to create the foundation and walls of the structure. The printing plans leave room for windows and a non-concrete roof, and can be adjusted to make room for wiring and plumbing as well. The whole thing is the brainchild of three Texas-based entrepreneurs, whose tech startup Icon aims to revolutionize sustainable home construction. Eight scientists from Switzerland’s ETH Zurich University have embarked on a bold plan to build the next generation of construction robots, and their proof-of-concept is a first-generation robot that is actively building a 200-square-foot homeon the school’s campus. The project is bringing together a suite of cutting-edge technologies including 3D printing, modular construction, and new methods of construction. The DFAB House is believed to be the first house in the world to be designed, planned and built using primarily digital processes. 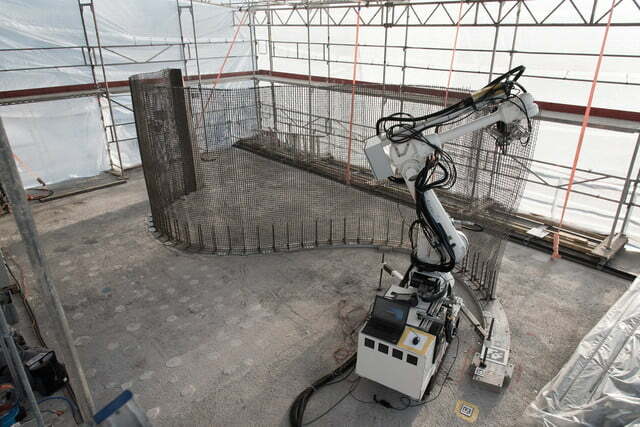 “Unlike construction projects that use only a single digital building technology, such as 3D printed houses, the DFAB HOUSE brings a range of new digital building technologies together. This allows us to use the advantages of each individual method as well as their synergies, and express them architecturally,” says ETH professor Matthias Kohler.